Through the hydrologic cycle, the same water that was on earth millions of years ago is still being used today. 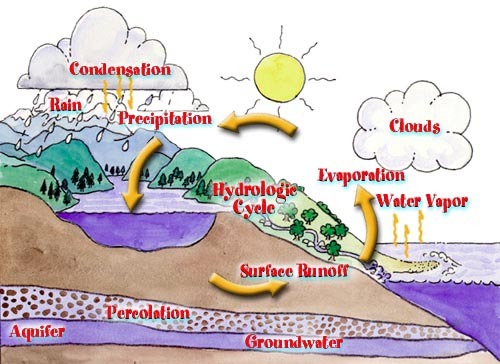 The hydrological cycle moves water from the earth to the air to the earth again. Water changes form as it goes through this process. As water evaporates, it travels into the air and becomes part of a cloud. The cloud stores this moisture until it falls down to earth as rain, hail or snow (precipitation). The rain evaporates and the cycle starts all over again – never ending. Water keeps moving and changing from a solid to a liquid to a gas, over and over again. We can see the hydrological cycle at work every day in some part of the world. After rain, runoff is created and travels over the earth’s surface, filling lakes and rivers. It also percolates into the earth, where it is stored in underground reservoirs, known as aquifer. In areas of high precipitation, there are usually large bodies of water, such as lakes and oceans. These areas allow more water to evaporate, forming clouds. In mountainous regions, the clouds move up and the water vapor condenses to form precipitation and freezes. Snow falls on the peaks and runoff occurs, starting the cycle over again.